Do you need a CPQ solution? Talk to almost any CPQ vendor, and you’ll hear a lot of promises being made. Most of these promises are based on speeding up the quote-to-cash time interval or accelerating the speed of business. But, do they deliver? Who do they actually help, and who can find better ways to drive process improvement? Before you commit to purchasing a CPQ system, you are going to want more than a promise backing up your funding request. Configure-price-quote covers a lot of functional territory. This technology can be architected as a simple CPQ tool that’s functionally limited to offering pricing assistance, or it can manifest itself as a far more elaborate CPQ platform that interfaces with a variety of enterprise-wide systems that bring role-based CPQ solutions that are tailored to the specific individual needs of a wide spectrum of users across the enterprise. How do you know if CPQ is for you? Conventional wisdom tells us that the answer to this question is found within your sales operation. Your sales force can answer part of the question, but it cannot give you a complete answer. Sales can tell you what challenges they face, and their performance metrics can tell you how efficient they are today, but there are other factors to be considered. Let’s start with sales; how can sales benefit from CPQ? Sales is a complicated process. Of late, it has become more complicated because the nature of selling has changed. At the same time, the nature of buying as changed as well. In many ways, what used to be called a selling or sales cycle has now become better described as a buying cycle. Much of the “stuff” that sales reps used to spend their time doing is now unnecessary or even wasteful. So, let’s look at the elements of selling within your organisation. What do your sales reps do all day? – Are they talking to prospects and providing them with useful information, or are they chasing down experts while looking for answers to prospect questions? Are they filling out call reports, win/loss reports and effort reports, or are they putting together quotes for prospects? Sales reps of old spent time smiling and dialing, sending out mailers, cold-calling businesses and other volume-based activities that would result in hitting an opportunity based on mathematical probability.If your reps are still spending their days walking through these motions, you need to consider that there is a better way of doing things. Sales reps should be talking to prospects and not be spending time doing housekeeping work during business hours. CPQ makes your sales reps self- sufficient. The “expert” is in the CPQ system. The sales rep can rely on CPQ to take care of so much of the time-consumptive processes, and your CRM and marketing automation systems can take care of the prospecting outbound campaigning. Your sales reps can be there when your prospect needs them. Complex products? Complex pricing? Complex Markets? – How much time are your reps spending learning about new products, memorising pricing updates or reading product advisories related to regulatory or safety concerns? Complex products, complex markets and complex pricing are becoming more and more common. Keeping up with changes and updates is essentially impossible in many instances. CPQ can remember all of this minutia and bring it bear as needed. Sales reps don’t have to have photographic memories or be members of Mensa to serve your prospects and customers well. Excessive errors – Pricing mistakes and configuration errors destroy your profitability and endanger customer relationships. An error made during the specification and configuration phase of your sale is probably going to drive a pricing error and then drive an entire production cycle that will produce a product that’s useless to your customer. If you are lucky and the customer’s trust in you has not been completely destroyed, you may get the opportunity to re-do the whole deal. How profitable is that?CPQ eliminates pricing errors by maintaining specific pricing lists associated with countries, customer classifications, product bundles and unit volumes. Illegal configurations are prevented by eliminating option choices as the specification interview progresses. Get the deal discounting – Too often sales reps will resort to last-minute discounts or even out-of-the-box discounts in the belief that it will help them close business faster. There is a time and place for discounting. It should almost always involve some sort of quid pro quo between buyer and seller. Without this, you are actively devaluating your product. CPQ provides built-in discounting for things like preferred customers, value sales and other specific discount programs. Deal fatigue – Some deals simply don’t close quickly. Large or complex customer organizations frequently require multiple levels of approvals for purchases. Some negotiators simply like to arm-wrestle longer than others. Too often this back and forth conversation slows down, and the time interval between contacts grows longer and longer. Ultimately, the rep may lose track or lose interest in continuing the conversation because there may well be easier business to close. CPQ helps to prevent that by making sure the rep is equipped to handle nearly any objection right now, on the spot. Pricing questions, configuration questions and special considerations in terms of the final deal are all within the power of the rep to address with the backing of the CPQ solution. Your deals won’t die of old age with CPQ. Lost opportunities – Selling into larger organisations is always a plus because there are almost always additional opportunities to be found. Other departments or divisions can possibly benefit from your product. Adding a bit of functionality here and there may allow your solution to provide additional unseen benefit to your primary end-user as well. Cross-selling and upselling have been called the easiest selling because they take advantage of the inertia your primary sale has generated. You have a built-in advocate in the person of your buyer. CPQ helps you identify these opportunities during your specification interviews. CPQ has the ability to untie your sales rep’s hands and equip them to do what they do best—sell your product. 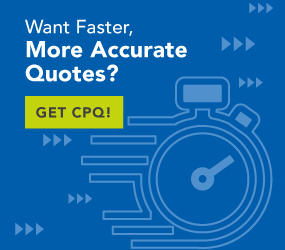 CPQ removes the obstacles of pricing complexity, customer objections, peripheral busy work and deal fatigue. It helps reps find extended opportunities beyond the context of the current deal and eliminate the pitfalls of configuration errors, pricing mistakes and the need to do unnecessary discounting. In following blogs we will look at the benefits of and needs addressed by CPQ in the rest of your organisation. As compelling as the sales arguments are, there are many other reasons to consider CPQ for your organisation.